Are you ready for a new garage? At Blue Sky Builders, we have years of experience helping Illinois residents build the garage of their dreams. Our team of garage specialists offers garages in a variety of sizes and designs depending on your needs, and we offer a wide variety of custom garage features to help you build the perfect garage for your property. 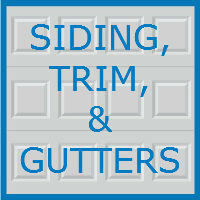 This week we are filling you in on three of our very popular garage features – aluminum trim, specialty siding, and gutters. Custom garage features like these can improve the aesthetic and functionality of your garage.